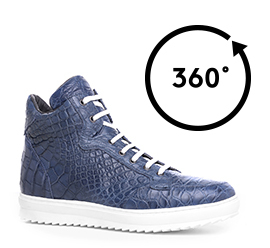 Exclusive high-top sneakers, finely hand-made in Italy, with upper made of luxurious blue crocodile leather. The white outsole of the latest generation is super lightweight rubber. A fine accessory that enhances every casual-chic outfit. The inner elevator system allows to increase the total height by 2.4, 2.7, 3.1 or 4 inches depending on the model chosen.